The nerve can become infected and die from bacteria living in decay when decay reaches the nerve chamber. Bacteria can also enter the nerve chamber through a crack in the tooth. Bacteria in the nerve chamber acts as a source of infection travelling down the root and then spreading into the jaw bone, gums and soft tissues. Oral pathogenic bacteria living in chronically diseased dental tissue can cause disease in other parts of the body. The same bacteria in dental infections can be cultured in plaques that block arteries, cause infections in artificial joints and heart valves and can affect other organs by lodging in these body parts. Chronic infections may initially not be painful and may be symptom free for many years. 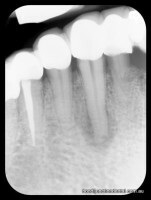 A chronic peri-apical infection will slowly expand destroying bone around the end of the tooth root. The body is able to defend against low grade chronic infections for some time until the patient becomes run down. Eventually all chronic infections flare up to become acute infections commonly during a cold or when people are under stress. Some chronic infections are actively producing pus (suppuration) at the root end. Over time the puss perforates the bone and gum and forms a channel for the pus to escape into the mouth thereby relieving the pressure. 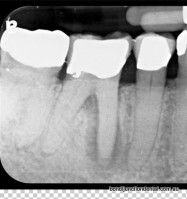 This type of infection is usually pain free until the channel blocks up when the tooth then become sore. Pain on percussion (tapping the tooth). Pain on palpation (pressing the gum over the root). Temperature change may cause pain – initialy worse with cold then progressively worse pain on heat. Localised redness may be evident. Chronic infections eventualy becomeacute infections requiring urgent treatment. Untreated dental infections may develop cellulitis. Cellulitis is a very rapid infection that spreads into the soft tissues and has its own momentum independent of the tooth. Cellulitis can become life threatening if untreated. Patients are very unwell, have severe pain, may have a temperature and have massive facial swelling that may block breathing. Irreversible pulpitis is the condition where the nerve is still alive but has become so inflamed that the nerve never settles down and continues to cause pain on any stimulus. Often the tooth symptoms disappear for some time only to return again.